Despite generally supportive environment for the work of human rights defenders in Mongolia, challenges do still exist. The operating environment for human rights NGOs, regardless of their size and income, is unduly complicated by the increased pressure from tax law and financial regulation requirements. There are also specific challenges faced by human rights defenders working on selected issues. The situation of human rights defenders, promoting corporate accountability in the extractive sector in Mongolia, is particularly complex nowadays. Because of their reporting and investigative work related to mining issues, these human rights defenders face a variety of threats and intimidation, both from the government and corporate actors. They are exposed to judicial harassment as well as vilification and smear campaigns. Human rights defenders and NGOs working on cases of corruption of government officials and criticizing government policies are often become victims of defamation suits, which are applied against them in an arbitrary and disproportionate manner in order to suppress their freedom of expression and assembly. LGBTI rights defenders in Mongolia are also at risk of harassment as well as members of the communities they strive to protect. Both regular citizens and law enforcement officials have been involved in attacks against lesbian, gay, bisexual and transgender people. These attacks have never been properly investigated and their perpetrators have never been brought to justice. In the absence of enabling legal environment and denial of the right to information, the human rights defenders are prevented from accessing remedies and getting a proper redress for human rights violations. 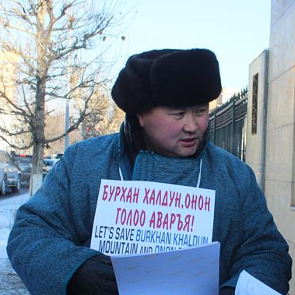 In particular, the third-party standing is not allowed under Mongolian law, unless the party claims direct harm. This means human rights defenders cannot file a complaint on behalf of a victim if no damage has been caused to them personally. There is also no provision that allows for the class action filing, despite the fact that in many cases whole communities suffer from the same violation committed by the government or a mining company. Finally, even if awarded the amounts of reparations are nominal and in view of excessively high court fees they become meaningless. The problem of lack of implementation of the court's decision also remains there.